Judge for yourself whether or not we have managed to lift our Catalogue to the next level again. We are very happy about it! 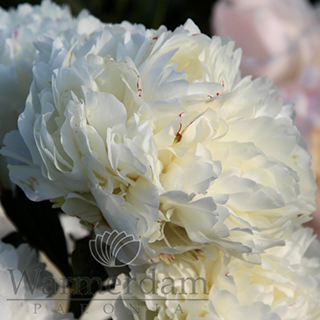 So many spectacular newbies and rarities... Also very pleasing we find the coverage of the great variety in peonies within our collection. Because we haven't missed a single group in peonydom with this year's expansion. What's more is that there's something beautiful and special here for every size wallet. Read more on this page what's all new and changed compared to last year's listing. 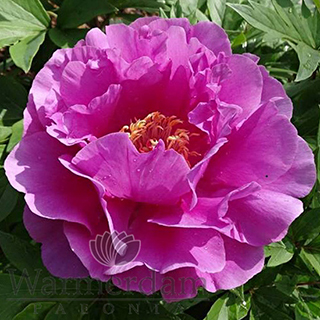 Our list for 2019 counts 16 botanical species/varieties, 70 lactiflora peonies, 76 herbaceous hybrids, 31 intersectional hybrids and 7 tree peonies. 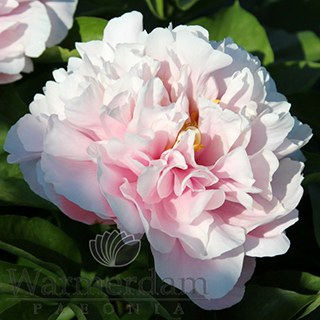 Compared to last year our new selection even shows 50 changes (of which 29 peonies are new arrivals and 21 are returning items). Disputably, 'High Noon' is the most famous woody of them all with her frequent glorious reblooming in August. And perhaps just as disputably, we consider 'Ruffled Sunset' to be one of the very best tree peonies. Well... I could talk for an hour about this these... But I better not. All very rare, exceptionally interesting breeding plants, fabulous peonies for in the landscape and just bloody gorgeous..
What a diversity in this group! Actually, a hodgepodge. If not for that the common denominator is the fact that these are hardly ever offered anywhere else. First mentioned is unmatched for intersectional flower symmetry and presentation, MOY and VoSP (loving abbreviations) are both also outstanding flower forms and also both by the hand of Don Smith and still very new and rare. Just like 'Sonoma Halo' - a unique and bright yellow and super full double flower for this group of peonies. Surely one of the projects that gives me the most satisfaction. Hunting down the most incredible peonies, lost in commerce for so long and for whatever reason, and bringing these back available. Not just novelties are something to look out for, wise people also look back. Because there is so much beauty in our peony world already! Michael Miely knows what good peonies are. All three hybrids mentioned here are just delicious, in terms of foliage, stand and form of the flowers. Truly an enrichment for any collection. Simply not (yet) in our even years' cycle. But definitely worthy to include every year! Really nice peonies in a wide range of colours for all that don't want to spend that much on a nice garden peony. Each and every one of these is unique in its own style and just drop-dead beautiful.